CALIFORNIA has many fascinating cities and towns, and a rich cultural history, but it is the variety and splendour of the natural scenery that impresses most. The state is full of contrasts and extremes - rocky peaks bearing snow all year are visible from arid deserts where the temperature may exceed 120°F, and the highest point in the US (outside Alaska) is just 80 miles from the lowest. The mountains of California support the world's heaviest, tallest and oldest trees, and have the sixth and seventh highest waterfalls. The south and southeast is desert country - not far from the sprawling, hilly suburbs of Los Angeles the land becomes predominantly low, flat and sparsely populated - a hot sandy expanse stretches for hundreds of miles, interspersed only by occasional barren ridges. The far southeast, beyond Palm Springs is part of the vast Sonoran Desert, which extends across south Arizona and into Mexico; this has the least rainfall and the highest temperatures of the American deserts. 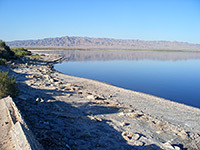 Apart from the the Salton Sea and the huge Anza-Borrego Desert State Park there is little of interest for visitors, although a large irrigation system, using water from the Colorado River has enabled this part of California to be farmed quite extensively. 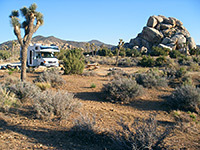 The Mojave Desert covers much more of California, roughly between I-10 and I-15 and west towards Bakersfield - here the land, although still very hot for much of the year, is generally higher, a little wetter and it supports more vegetation, as exemplified by the varied life in the Joshua Tree National Park. Other points of interest include many miles of sand dunes, several ancient volcanic craters, old mines and ghost towns. A large proportion of the Mojave is used by the military, for weapons testing and army training. Further north, Death Valley is part of the Great Basin Desert that includes most of Nevada and parts of Utah and Oregon, and is characterised by alternating narrow mountain ranges and wide valleys - this area has no extended rivers and all rainfall eventually collects in salt flats on the valley floors, and either evaporates or sinks below ground. The long, fertile Central Valley from Bakersfield through Sacramento produces half the produce of the US, largely due to intensive irrigation, but most of the rest of the state is mountain country; the steep, narrow Sierra Nevada range dominates the south-central area, with many summits above 14,000 feet. There is endless unspoilt Alpine scenery with beautiful glacier-carved valleys, lakes, granite peaks and towering waterfalls, all of which is protected by several National Forests and the famous Yosemite, Kings Canyon and Sequoia National Parks. 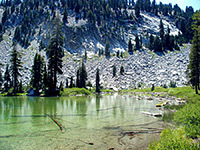 The north of California is less inhabited and more generally wooded and mountainous; most is part of the Cascade range that continues northwards through Oregon and Washington to Canada and contains many volcanoes in various stages of dormancy; the main peak in Lassen Volcanic National Park erupted as recently as 1915, and this area still has many active geothermal features. Several glaciers are continuously moving on nearby Mount Shasta, another extinct volcano, while in the far north, the Lava Beds National Monument has many more volcanic features, especially ice caves. 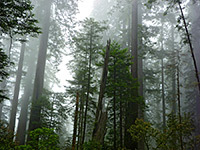 Besides vulcanism, the north is also renowned for remote, windswept beaches such as at Trinidad and in particular for the huge coastal redwood forests that cover the rugged hillsides close to the ocean - Redwood National Park and related state parks is the most well known location but there are many other protected areas including Humboldt Redwoods State Park and Muir Woods National Monument.